The use of fasteners has grown extensively worldwide, increasing the need for standard sizing. Standardization prevents the use of improper screws, and ensures screws are compatible with the materials being used and are appropriate for the project at hand. Screw dimensions include the driver type -- such as flat, Phillips or hex -- length, shank diameter and threads per inch. 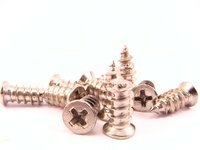 Screws have standard U.S. and metric numbering systems. Metric screw measurements list the diameter in millimeters first and thread pitch second. Examples: 4 mm x 0.7; 5 mm x 0.8; and 6 mm x 1.0. U.S. standard numbering systems list diameter sizes 0, 1, 2 ,3, 4, 5, 6, 7, 8, 9, 10, 12, 14 and 16, and fractional sizes from 1/4" to 2" in 1/16" increments, followed by a dash and the threads per inch (from about 6 to 80), and the length. Screw diameter, the first number listed in the size charts, must match the inner diameter of the matching nuts and washers. Diameter is measured at the shaft, just under the screw head. Sizes 0 (3/50 inch) to 16 (3/8 inch) were standardized by the American Society of Mechanical Engineers (ASME) using hardware sizing systems already in use at the time. Screw diameters measured in standard U.S. fractions of an inch were added more recently. Increases in the numbers (0-16) coincide with increases in shaft and head diameters, but not screw length. Each diameter size may have a different length, depending on the job. The second number on screw size charts, following the hyphen, refers to the number of threads per inch of screw shaft. So a screw sized 1/4-28 is 1/4" in diameter with 28 threads per inch, and a #6-32 screw has 32 threads per inch on its shaft. Pan head screw (round heads) length is measured from the flat bottom of the head to the screw tip. Flat head screws measure length from the top of the head to the screw tip. The length is typically the third number listed in sizing charts and follows an "x" (multiplication symbol). So a 5/8-24 x 1" screw has a diameter of 5/8", 24 threads per inch and has a 1" shaft. A #8-20 x 3/4" screw has 20 threads per inch and a shaft measuring 3/4" in length. Some screws will not measure the threads per inch, only the diameter and length (such as #10 x 1" or 5/16 x 1/2"). How Many Types & Sizes of Phillips Screwdrivers Are There?